OAKLAND, CALIF. – (RealEstateRama) — According to international award-winning firm KTGY Architecture + Planning, well-designed luxury homes targeting 55+ buyers in amenity-rich communities continue to experience strong demand. Prior to Toll Brothers’ Regency at Summerlin® opening, the sales team had hundreds of individuals on their waiting list. Toll Brothers Group President Gary Mayo says that 45 homes were sold within the first four months after the models were open, and the waiting list has grown exponentially. Regency at Summerlin® is Toll Brothers’ first Active Adult 55+ Community in Las Vegas, Nevada, and the first age-qualified, single-family neighborhood to open in Las Vegas in 15 years. The KTGY-designed homes offer resort-style amenities and a low maintenance lifestyle with the quality and prestige associated with Toll Brothers. Designed for the luxury 55+ buyer and nestled in the 450-acre Cliffs village of the Summerlin® master-planned community, the staff-gated neighborhood offers three distinct home collections with each collection featuring three unique single-story floor plans, says KTGY Design Principal Bill Ramsey, AIA. 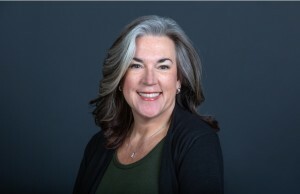 Ramsey is located in KTGY’s Oakland, California office and is one of the top architects in the Las Vegas market. “Varying lot sizes combined with creative set-backs establish distinctive outdoor spaces unique to each home, furthering the luxurious custom feel of the community. 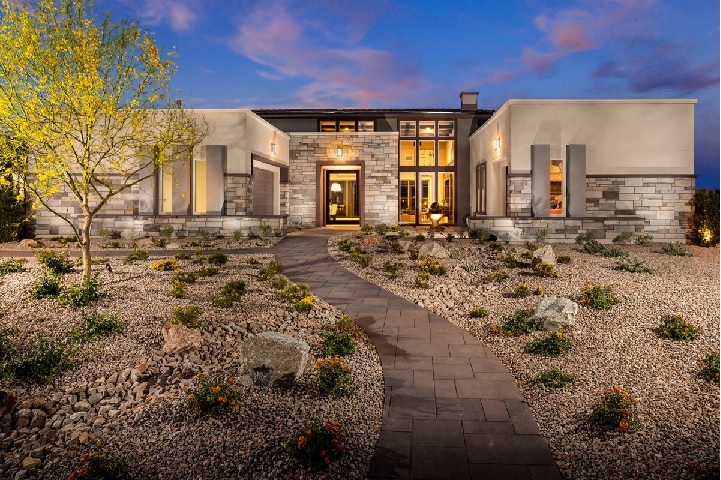 The desert contemporary exteriors, open floor plans with ample room for entertainment and relaxation, plus the Vegas-style pool with private cabanas, are just few of the many features that set this 55+ community apart,” Ramsey said. “Many of the homes have oversized front, rear or side courtyards, which provide amazing indoor-outdoor opportunities plus some with stunning views. 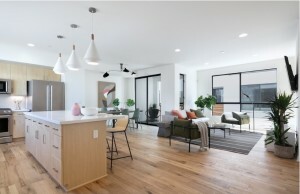 The homes also include gourmet kitchens, expansive great rooms with access to a large patio through standard 12’ sliding glass doors, and numerous flex spaces to allow for personalization to suit a buyer’s individual lifestyle,” commented Ramsey. 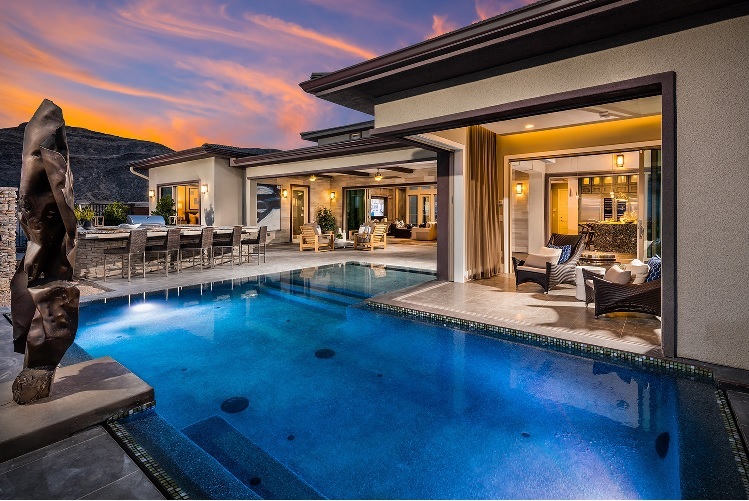 Regency at Summerlin® offers three different lot sizes to accommodate each home collection, 55’x90’ (Summit Collection), 65’x90’ (Palisades Collection) and 75’x90’ (Pinnacle Collection), but it is the two biggest plans on the largest lots that are the best sellers. “People are willing to spend money on their dream retirement home when everything on their wish list is right here at Regency at Summerlin®,” Ramsey said. Upon build-out, Regency at Summerlin® will include 458 single-family homes ranging from 1,665 to 2,424 square feet. Offering an exceptional luxury active adult lifestyle, Regency’s robust community amenity list includes walking trails and an amenity center, which was also designed by KTGY, spanning more than 16,000 square feet with indoor lap pool and outdoor resort-style pool; tennis, pickle ball and bocce ball courts; a clubhouse; and social programming that includes classes, events, and a dedicated on-site lifestyle director. The clubhouse and all amenities are expected to open this winter. For more information about Regency at Summerlin®, visit: www.RegencyatSummerlin.com.